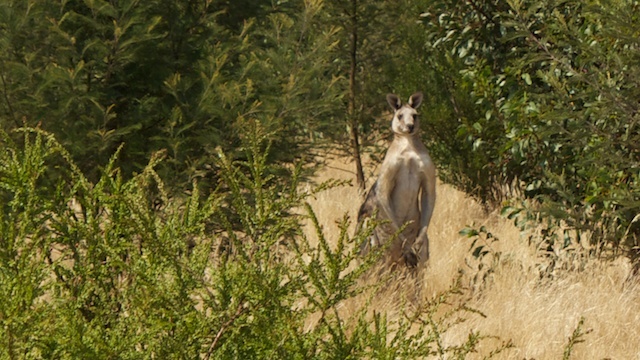 Today we went on an all day tour called "Kangaroos and Koalas." It was this and so much more. We began with about an hour bus ride (in a very nice bus), to the Serandip Open Range Sanctuary. This is not a zoo, it was a farm that the Australian government purchased as a protected area for indigenous wildlife. This is near the town of Little River, the namesake of the Little River Band. Ah, Reminiscing. Emu strolling down the path toward us. We began with a ride around the sanctuary, then continued for a short walk through the bush to a billabong*. 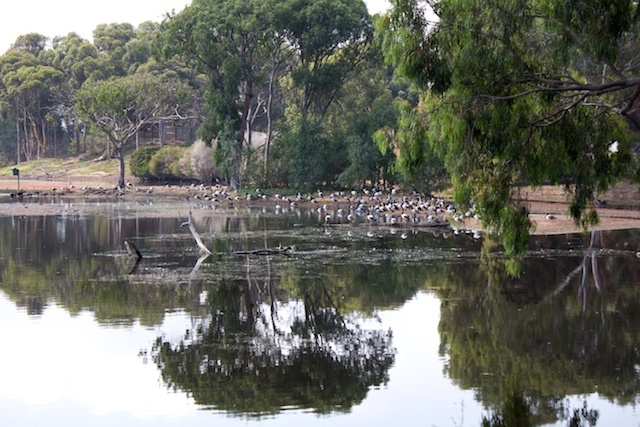 Over the course of the morning we saw Emu's, Kangaroo, Black Swans, Magpie Geese, and lots of other birds in their natural habitat. 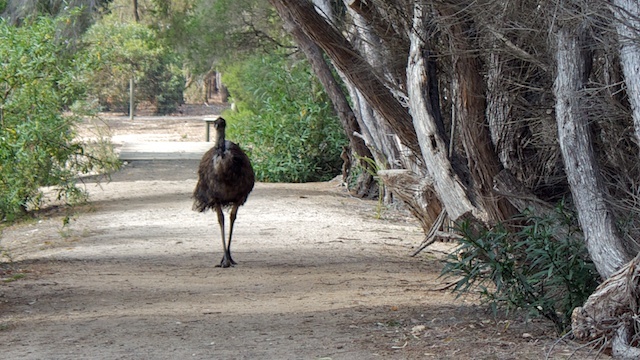 At one point, an Emu was walking down the path toward us. We all moved quietly to the side of the path so it could pass without feeling threatened, but it stopped a few yards from us and decided to turn around. There were lots of Emus and Kangaroos. 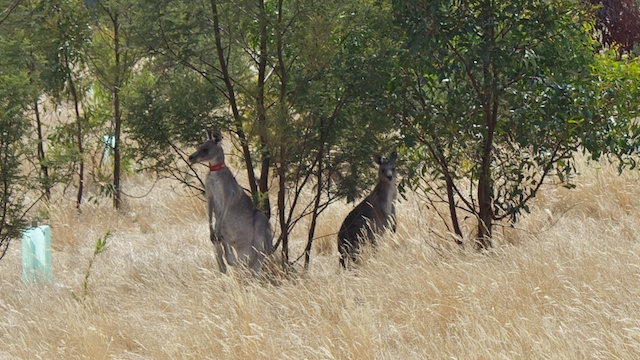 A few of the Kangaroos stopped to pose for us, but mostly they were hopping away from us. It was a lot of fun to see them in the wild. Our next stop was back to the picnic area where the tour organizers had a barbeque lunch waiting for us. There were hamburgers, veggie burgers, beef sausage, pork sausage, grilled egplant & peppers, salads, cookies, and fruit. All that plus beer, wine, soda, coffee and tea. After lunch an Aborigine man from the Wathaurong tribe came in to give us a talk on various tools made by his people. Although some items he showed us were handed down from his father, most of the items were made recently, either by him or his family members. He talked about how his father and uncles taught him how to make these tools and weapons. Since this man was only in his 30's at most, I left there convinced that the Aborigine culture is being preserved in Australia. 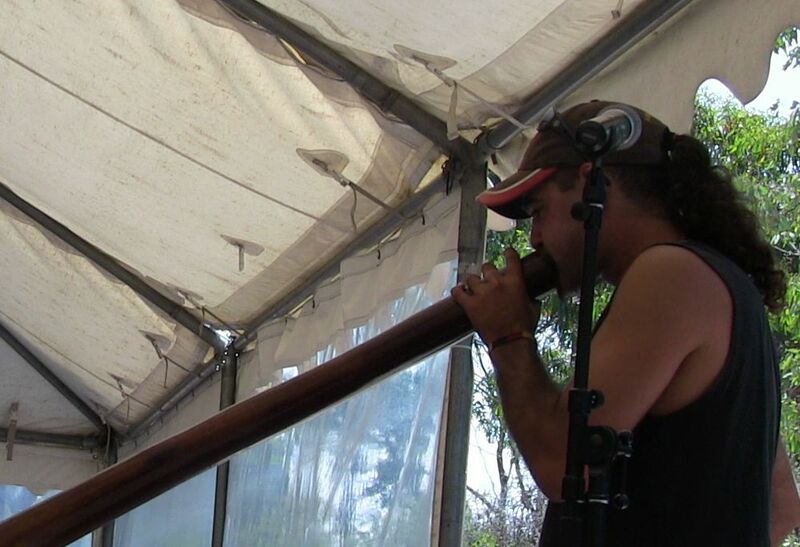 At the end of his presentation, he talked about the iconic Aborigine instrument, the didgeridoo and played it for us. This is an amazing instrument that requires the artist to breathe in and out at the same time. I got some good video of him playing, but like all my video, I won't be able to edit and share that until I get home. This internet connection is just not good enough for video uploads. In the afternoon, we drove on to a nearby National Park, where rangers monitor koalas in the wild. Koalas don't move very fast, so the rangers were able to spot a few earlier in the day, then lead us to where they were. 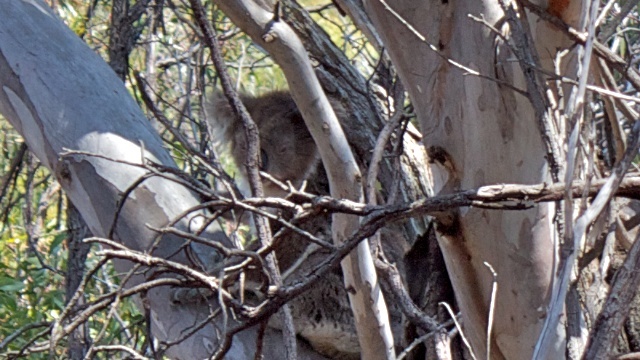 We were able to see 2 females up in Eucalyptus trees. The rangers claim that they can identify individual koalas by the patterns around their noses, and have named each one. They are studying them to learn more about their behavior and how they can be better protected. This was a great day. Now for another great dinner. 1. a backwater channel that forms a lagoon or pool. 2. a branch of a river running to a dead end.